I think I’ve mentioned here before that Eric and I very much enjoy all things wine. We got engaged while on a trip to California wine country. We like trying and tasting new wines. We also love to attend an occasional wine festival every once in awhile. After one such trip to an poorly organized wine festival last year, we thought “hey, we could put on a pretty good wine event at home.” And so we did. We’ve hosted two little at-home wine festivals so far and they’ve both been a ton of fun. Here’s how it works. Everyone brings one bottle of wine for sharing (some people end up bringing more, which of course isn’t an issue in the slightest). Eric and I provide the venue along with some light snacks. We also usually contribute a few bottles of wine to the mix. Everyone comes over, we open the bottles, everyone samples what they want, drinks more of what they like. It’s a very fun time. 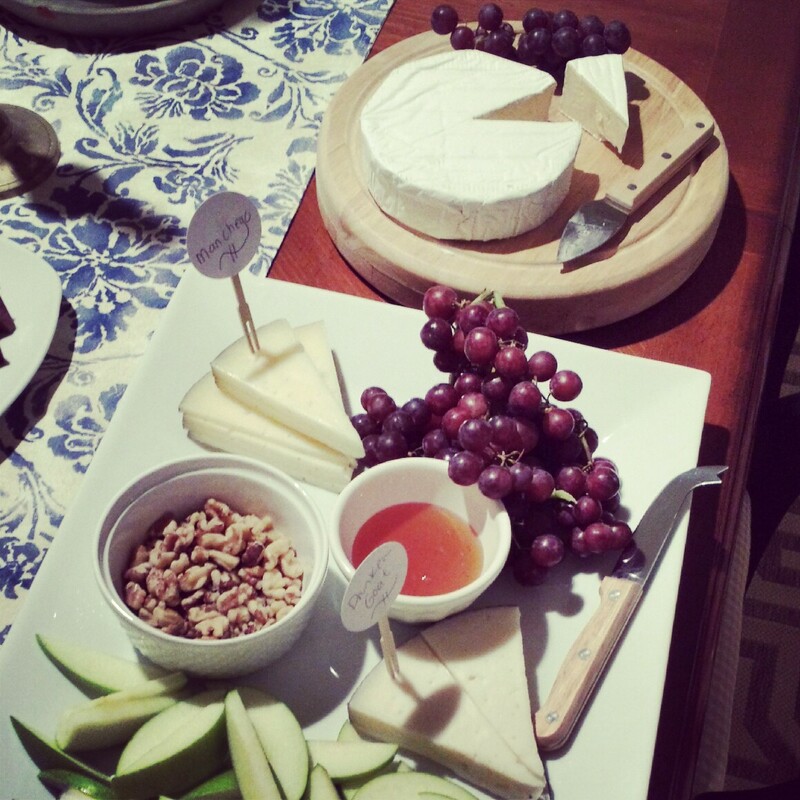 Now these at-home wine parties aren’t very structured — at least the way we do it. You could ask certain friends to bring white and others to bring red if you want. We just leave it open to what they like. For snacks, I like to do a cheese plate. Cheese and wine are just the natural pairing. I like to do a brie and some hard cheeses (above are druken goat, iberico and manchego), then I add some slices of apples and grapes, nuts and honey and boom — cheese plate done. 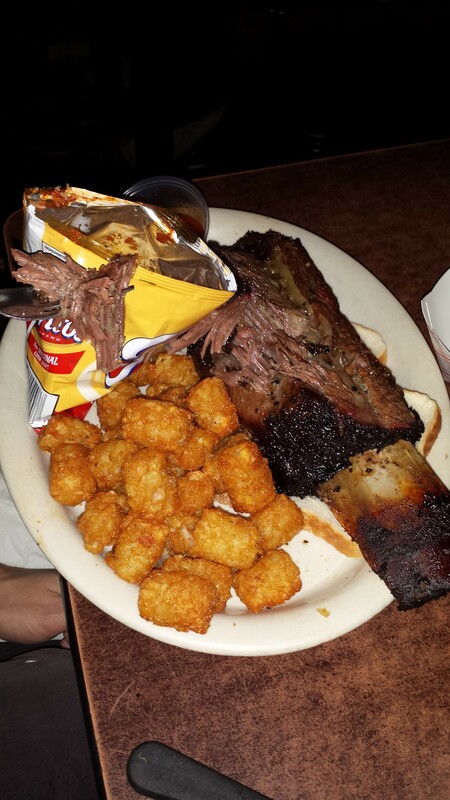 We also usually do some sort of small appetizer (the first time we did pigs in a blanket it. This last time we did Bagel Bites). 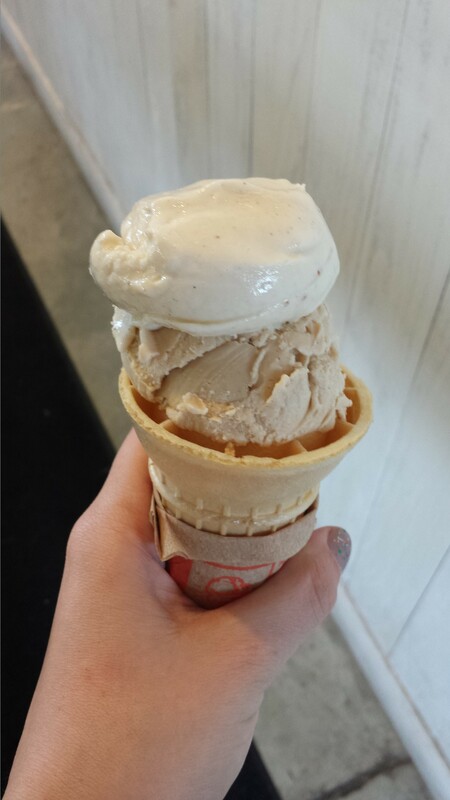 We throw in something sweet too, like chocolate or a baked good. 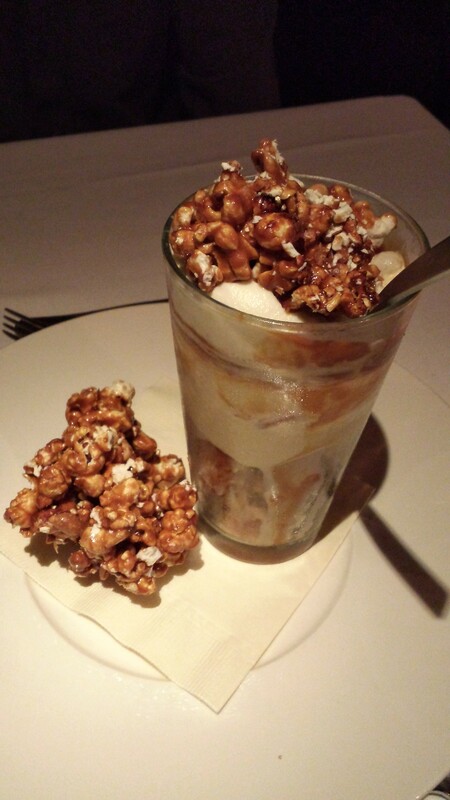 It isn’t a full meal or anything — just something to snack on while you are all drinking. You don’t need to be a wine aficionado to host one of these gatherings. This is a great opportunity for people who might not know that much about wine to try a bunch of different kinds without having to take the plunge and buy a whole bottle. And it is just a good time overall. I highly recommend doing it. Winter storm Pax is officially past us! As I am typing this, I can hear the ice and snow melting off the trees outside our house. Which is good because Eric and I have dinner reservations tonight and you best believe I want to make them. I saw this Buzzfeed article ranking a bunch of herbs and couldn’t help but weigh in on it. I love me some herbs. Now I’m not going to lie — some of these I haven’t used or even heard of (what the heck is hyssop?). But I definitely agree with their top five. Throw sage in there and those are all my favorites. Granted, I do think they have oregano a little low on the list (my Italian roots make me biased, I suppose), but I’ll let that one slide. 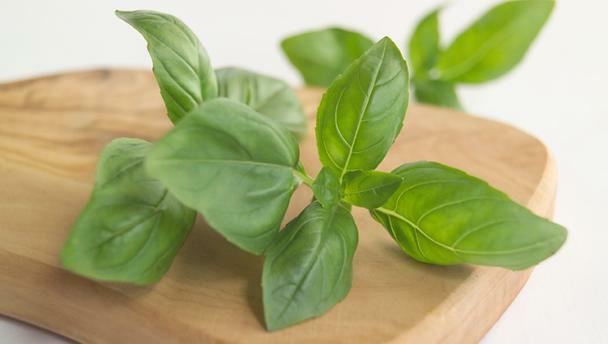 For the past few years, I’ve attempted to grow basil, mint and cilantro on my own, but basil has been the only one that I’ve had success with, which is sad because I love some fresh mint for mojitos and cilantro for homemade salsa or guac. I have little to no green thumb so maybe it’s best if I just give up. I sometimes feel that if I don’t go to HomeGoods at least once a week, I am missing out on something. I’m sure that is not the case, but it makes sense in my head. I take my trips to HomeGoods without any specific item in mind, and sometimes I leave empty handed, but sometimes I find some good things. My last trip resulted in a few goods things, all of which I had been keeping my eye out for for a little while. I didn’t go crazy and spend too much (I think the total was less than $20) but I figured I’d share what I got with y’all anyways. I’ve always wanted one of these olive oil bottles, but all the ones I’d seen before had weird designs painted on. When I saw this plain one, I had to scoop it up. 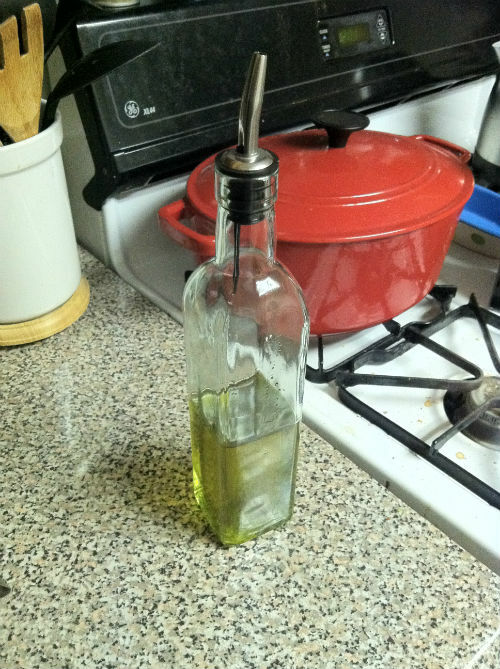 I buy olive oil in bulk so it is much easier to use this when cooking than trying to drizzle out of a giant bottle. 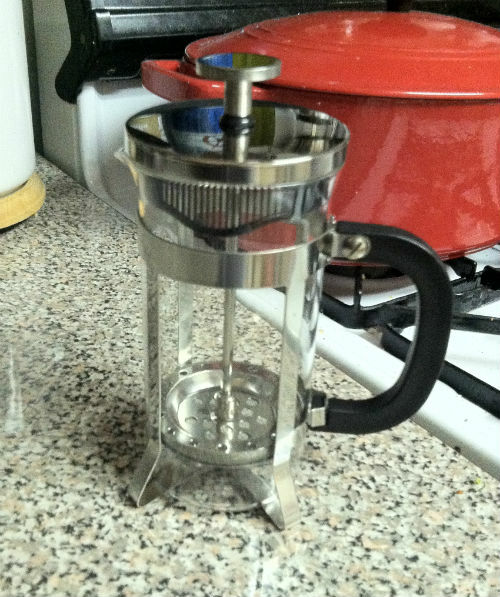 This little French press is the cutest thing ever. It makes about one cup of coffee (or tea) so it’s great for solo use. I’ve been wanting a French press for awhile and this small one is giving me a chance to try it out before I get a bigger one. Spoiler alert: I love this. I’ve mostly been using it to make loose leaf tea and it’s amazing. Now there are sometimes when I’m making something and I don’t think it’s right to be served on a plate, but it’s not quite bowl material. Enter these pasta bowls. They are like the perfect hybrid of a bowl and a plate. 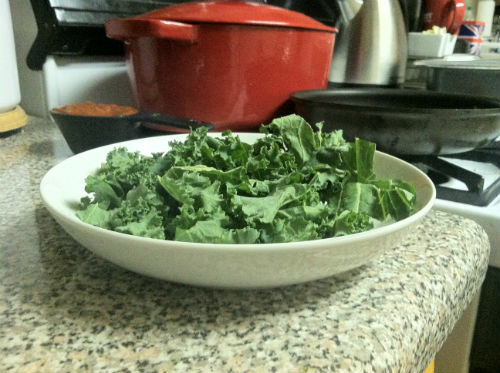 Here is some kale I was cooking with last night. I think these are going to be great for salads as well as pasta. 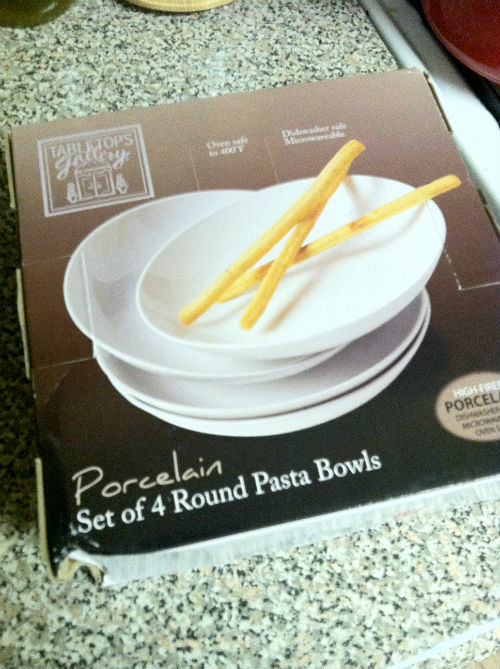 I am now regretting not getting the other box that HomeGoods had, but like we need anymore plates, bowls, etc. My friends know me well. 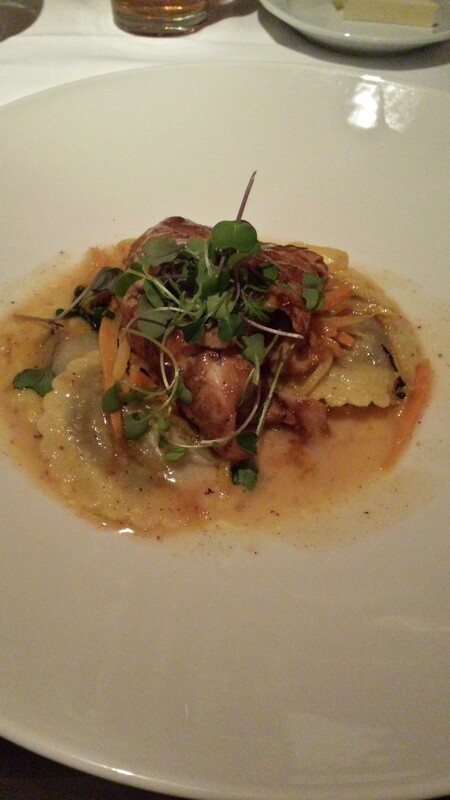 They will often send me links and articles pertaining to food. My friend Lauren send me an email this morning containing this article and I just had to write about it. 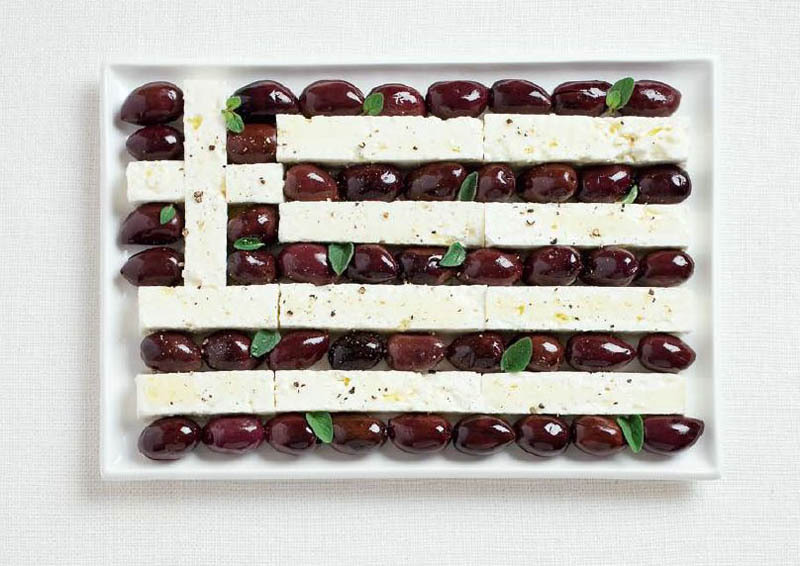 A local advertising agency in Australia designed a bunch of international flags made up of some of the foods each country is known for. It is to promote the Sydney International Food Festival. As a graphic designer AND a foodie, I found these to be awesome. 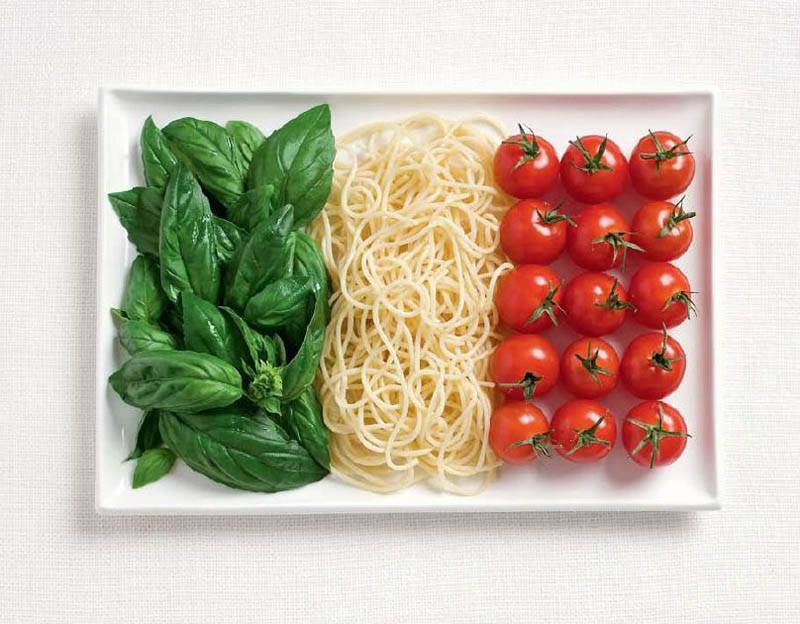 Italy, made of basic, pasta and tomatoes. 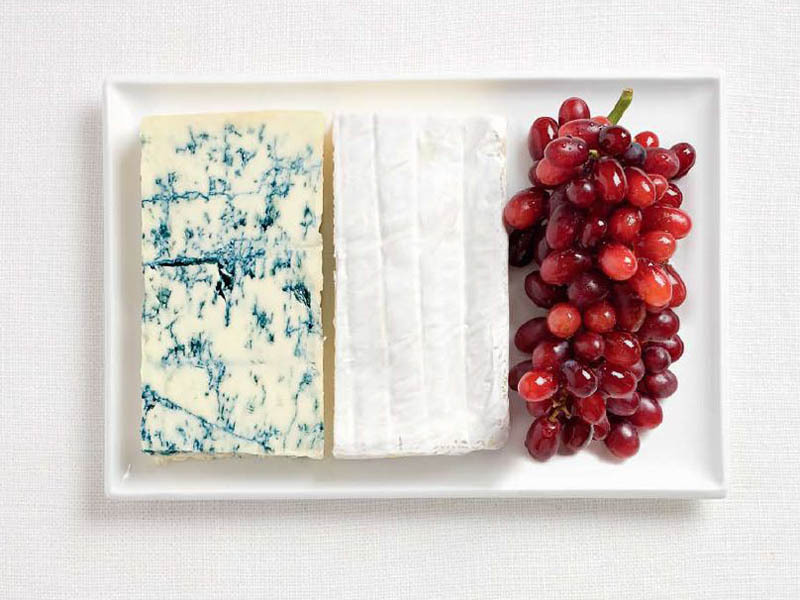 France, blue cheese, brie and grapes. Aren’t these awesome? You can see a pattern in the ones I have gravitated to — cheese and carbs, my two loves. Some of the other ones they posted are super intricate and awesome. Check the rest out here.